Alles Bestens, würden wieder das selbe Appartment buchen. Perfect location and nice view to the tiny plaza. Clean apartment, small but fine kitchen, super bathroom. Clean, comfortable, good location, nice bottle of wine! 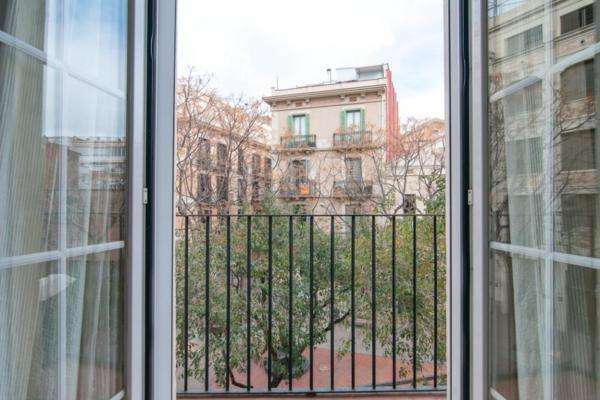 Situated in the charming Gràcia district, this studio apartment in Barcelona is a fantastic choice for your trip to the city. This neighborhood maintains a distinct Catalan atmosphere, while being home to some of the best sights in the city, like Gaudí´s colorful Park Güell. The central location and easy access to public transportation allows you to explore all that Barcelona has to offer! This lovely apartment is furnished with a comfy double bed and the living area has a sofa and a TV, making it the ideal spot to unwind. You can easily stay in touch with those back home, as an Internet connection is provided. This homely holiday apartment also has a well-equipped kitchen making it easy to prepare your favorite dishes at home. By choosing this apartment in Barcelona, guests will not only enjoy easy access to some of the most famous landmarks in the city, but enjoy a warm and comfortable place to call home.